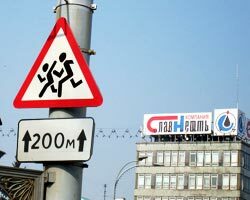 All the most frequent Children's Crossing Signs from the former Soviet block show a clear relationship. I call them the Russian Group. the body is made with four building blocks: a head, an arm, a leg and a main block containing the torso and the remaining limbs. Belarus most probably noticed that match-stick roadsigns do not bring any improvement to trafic safety (see also Iconization is threathening our children.) and therefore ordered a new sticky sweet design. The drawing is targeted towards kindergarten. It fits with the current habit of suffocating the message with fluff and taking adults for five year olds (sometimes appropriate though). Real street pollution. Find other examples in New Caledonia and Madeira).